Nick Ledgard, New Zealand Tree Grower August 2007. 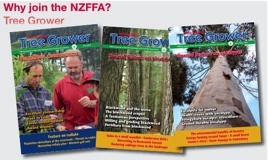 Over the last decade, southern New Zealand has seen more new land planting of Douglas fir than any other tree species – including radiata pine. The reason is because it grows well in the inland parts of the South Island high country where world record growth rates have been measured. In such areas, Douglas fir not only performs well, but it reproduces well. Many readers will have seen the ankle-deep carpets of cones beneath trees, which can produce thousands of viable seeds almost annually. The seed is winged and light, and if produced in an exposed site can be distributed by the wind for many kilometres. The above reasons contribute to the fact that Douglas fir is now recognised as a species capable of vigorous wilding spread. Surprisingly, this was not the case 20 years ago. It is suspected that the Douglas fir cone litter under 20-year old trees in the Mackenzie Basin increasing numbers of fast-growing wildings seen today are associated with the presence of mycorrhiza, symbiotic fungi associated with their root systems, which appear to have only become widespread comparatively recently. Douglas fir is more shade tolerant than the common pines and will invade shrublands. Small seedlings can also be found within forests, but contrary to popular belief, they will not establish readily under high canopies. Research has determined that the species needs 40% of full light to achieve the consistent growth needed to reach canopy level. The best growth for Douglas fir is often found in cooler, inland hill and high country areas, where the surrounding vegetation cover and grazing levels can be light. Such circumstances can lead to a high risk of wilding spread. Assessment forms are available to assess this risk, available from the author, and there are a number of strategies which can prevent or reduce it. Grazing and improved pastures are the most obvious – one never sees a wilding alongside the many-species shelterbelts growing on developed farms. Fertilising alone will increase competition from resident vegetation and thereby reduce wilding emergence. But the increased fertility may also promote exotic weeds which can submerge slower growing native species. Another option is not to plant on exposed take-off sites, or to plant a less spread-prone species, such as ponderosa and radiata pine, around stand margins as much of the seed leading to wildings comes from edge trees. However sometimes, despite there being excellent growth opportunities, the risk of spread can be just so great that Douglas fir should not be planted at all. 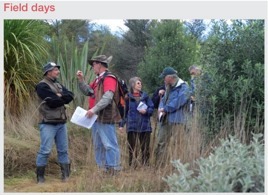 The author is secretary of the New Zealand Douglas fir research co-operative, and also currently manages a three year wilding project funded by MAF’s Sustainable Farming Fund. It involves all the major stakeholders, and aims to make wilding prevention and control an accepted component of everyday farm management.